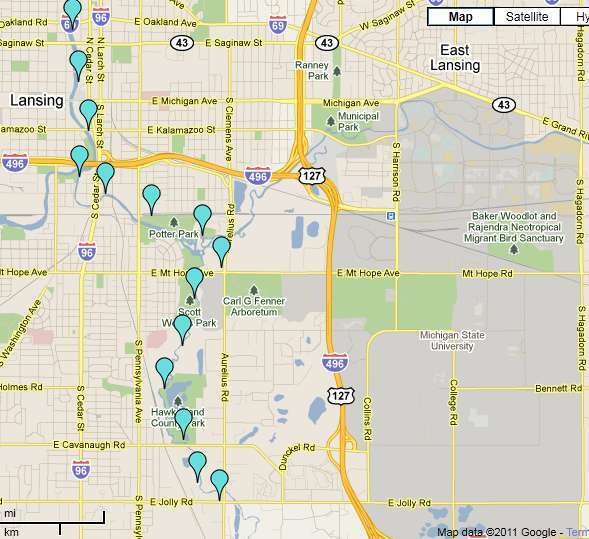 The Lansing River Trail is a fantastic paved trail for bicyclists, walkers, joggers, and roller skaters. The paving is well done and the view along two rivers (Grand River and Red Cedar River) and through nature is terrific. The trail is approximately 8 miles long and can take one from the Michigan State Campus right down to downtown Lansing and the State Capital Building. I spent the weekend in Lansing starting off at an MSU football game and then biking to the State Capital finishing the day with dinner at a restaurant named Troppo's which was an incredible restaurant, e.g. food, location, ambience. The trail will lead you across many nice wooded bridges with scenic views of the water and abundant wildlife. There are also many parks and attractions along the way, such as Potter Park, Hawk Island Park. Impression 5 Science Museum, the Lansing Farmers Market, the Turner-Dodge House, and Lugnuts' Stadium. The River Trail is also home to a number of special events, including the Common Ground Music Festival, the Annual Mayor's Walk, Michigan Run, the Capital City River Run and a number of other city-sponsored activities.